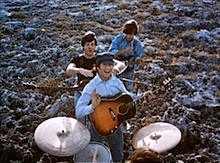 "Help" is mostly a Lennon composition, with a few suggestions from McCartney. They wrote the song at John's house at Weybridge on April 4, 1965. It was released as a single on July 16, 1965 and July 23, 1965 in the U.S. and UK respectively. The single originally had "From the the United Artist's Screenplay Eight Arms to Hold You," the original title of the film. An interesting Beatle fact is that the single is a bit faster (and not quite as polished, according to some) than the album version. Lennon's intonation and emphasis on certain lyrics is different on the single, plus the lyrics of the two versions differ very slightly. Lennon was very proud of the song and was also proud of his honesty inasmuch as he admitted years later (and frequently in interviews) that he was very insecure and literally calling out for help. The song was recorded on April 13, 1965 at Abbey Road Studios. Harrison and McCartney provide backing vocals to Lennon's lead. McCartney plays bass, Lennon acoustic guitar, Harrison lead guitar, and Starr drums and tambourine. On many bootlegs that contain conversation during the recording session, it is obvious that Harrison could not play the middle lead part easily. When performed live, it is also obvious that Harrison played a simpler version of the middle lead.